Barwon South West extends from the tip of the Queenscliff Heads to the border of South Australia. It is home to Victoria’s largest regional city, Geelong. The region has access to a deep-water port at Portland, an established rail network with interstate connections and several commercial airports. The picturesque Great Ocean Road is a significant feature and tourism asset. Barwon South West combines the Barwon and Great South Coast regions. Aireys Inlet, Anglesea, Apollo Bay, Camperdown, Colac, Geelong, Hamilton, Lorne, Port Campbell, Port Fairy, Portland, Torquay and Warrnambool. The region’s rich soil provides the basis for thriving horticulture, viticulture, dairy production, timber plantation/harvesting, cattle grazing and wool production. The world famous Great Ocean Road attracts thousands of tourists throughout the year. Geelong has a longstanding manufacturing and engineering base, with particular strengths in automotive and textiles. Various large and international companies call the region home including Keppel Prince Engineering, Quicksilver, Rip Curl, Cotton On, Godfrey Hirst and the Warrnambool Cheese and Butter Company. Barwon South West is highly regarded as a centre for excellence in education. 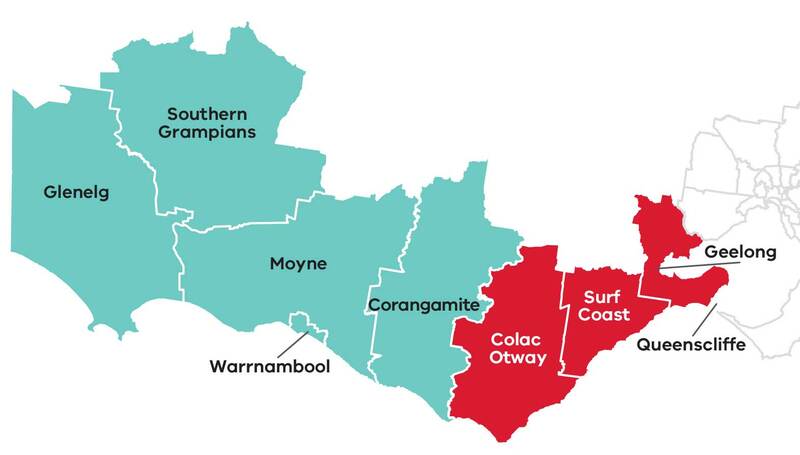 With both government and independent options available at primary and secondary level, the region is home to TAFE and university institutions including RMIT in Hamilton, and the expanding Deakin University in Geelong and Warrnambool. With its protected rainforests, spectacular coastlines, mountain cliffs, volcanic craters, lakes and waterfalls the Barwon South West region offers a multitude of outdoor activities for all ages. The region is home to a variety of nationally and internationally recognised sporting events including the Rip Curl Pro World Surfing Titles and the world’s largest organised swim, the Lorne Pier to Pub. In October 2010 Geelong was the base for the 77th UCI Road World Championships. This event is second only to the legendary Tour de France in terms of importance and prestige in international cycling. A number of enviable sporting complexes dot the region including golf courses and aquatic centres as well as thoroughbred and harness racing tracks, speedways and go-karting facilities. The Barwon South West region is home to a number of locally owned galleries and studios, with many of the artworks inspired by the spectacular coastal scenery of the region. A fascinating range of local museums present treasures rescued from shipwrecks and experience seaport life in the late 1800s. The region hosts year-round cultural events including Toast to the Coast, the Geelong region’s annual festival devoted to food, wine and music. The Port Fairy Folk Festival, a vibrant and exciting cultural celebration featuring more than 100 musical acts and around 500 artists. The Warrnambool Fun4Kids Festival, an eight day festival that aims to celebrate the imagination and creative spirit of children and the biennial Australian International Airshow held at Avalon Airport. Development of alternative energy sources (such as gas, wind, geothermal and wave energy power plants), which may also help to maintain the region's presence in aluminium production. Continued growth in wind-farm construction of wind farms in the region, with wind turbine development centred around Portland. New opportunities are emerging in plantation timber and mineral sands and - in the region's east - in services, tourism and biotechnology. Climate change poses significant challenges for the region. Coastal towns, buildings and infrastructure are at risk from of higher sea levels, erosion, flooding and storm surges. Inland, there will be an increased risk of bushfires. Water resources are likely to be constrained, with wetlands and shallow lakes at risk of drying up. Retention of skills and upskilling of workforce will be important in securing key businesses in the Barwon South West region into the future, particularly with an economy shifting toward services such health care and social assistance. The RDV information portal has more detailed data and statistics on the Barwon South West Region and regional Victoria more broadly.